The struggling Thunderbirds entered Tuesday nights Directors Mortgage two for Tuesday having only won two of their previous seven games. Things wouldn’t get any easier as the T-birds hosted the red hot Prince George Cougars. 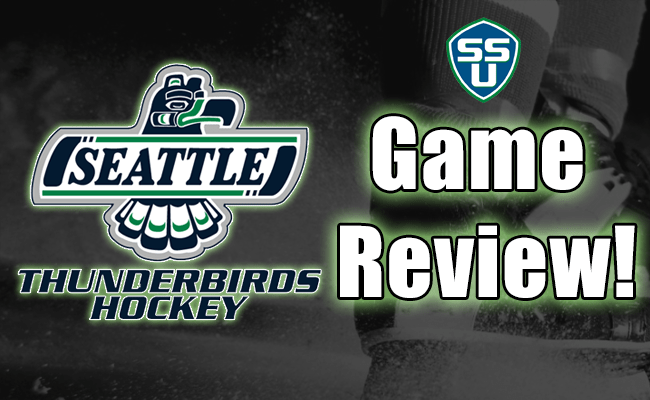 The tone was set early in this one, as the Thunderbirds (18-11-2-0) started the game sluggish, and with little fire. The Cougars (20-10-1-1) came out looking like a team on a mission, causing problems for the depleted Birds almost immediately. A scramble in front of the Seattle net less than two minutes into the first period had to go upstairs to be reviewed. Luckily for the T-birds it was ruled no goal. The Cougars would eventually open the nights scoring on a Justin Bethune goal scored at 6:50 of the first period. The Thunderbirds would come back and tie the game on an Ethan Bear slap shot at 11:53. An odd play in the dying moments of the first would see Prince George take the lead. On what looked like a harmless dump in on net Seattle goaltender, Logan Flodell would misplay the puck and it would go off a Seattle defender into the net with a little over thirty seconds remaining in the frame. The second period would see Prince George take over the game completely. The Cougars seemed to have more speed and controlled all three zones for almost the entire frame. Bartek Bison would extend the Cougars lead on an even strength goal on a coverage breakdown in the Seattle defensive zone. The Thunderbirds would squander a three-on-one opportunity halfway through the second when defenseman, Jarret Smith seemed to get cold feet and made an ill advised pass instead of taking an open shot. The Cougars’ Jesse Gabrielle took the puck the other way on a breakaway and make a good move on the Logan Flodell to put the Cougars up 4-1. Ethan Bear would contribute his second goal of the game on a Seattle power play very late in the second stanza, but that would be it for the T-birds. The third period would begin to break down, as the physical play would increase and emotions and tempers would run high. Prince George continued to carry the play add two more goals from Jesse Gabrielle and Colby McAuley. The Thunderbirds have some real soul searching to do, as they are currently without the services of their top three centermen, Mathew Barzal, Scott Eansor and Alexander True. Depth players will need to step up and contribute offensively as the three gone to the World Junior Championships make up a large percentage of the T-birds offense. Prince George Cougar forward, Jesse Gabrielle gets the award tonight leading the Cougars offense with two goals and an assist. The Thunderbirds will be in action Friday Dec 18, 7:35, ShoWare Center, Kent, WA. Against the last place Tri-City Americans. This will be the final home game before the Christmas break.